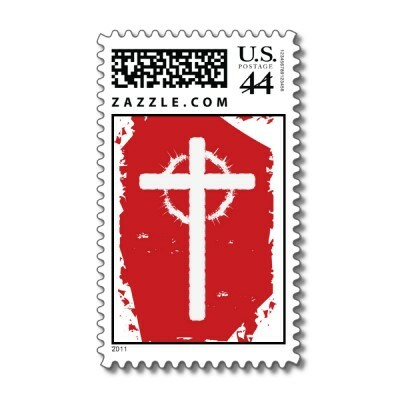 The Church and State - Artistic proof of America's Christian heritage. 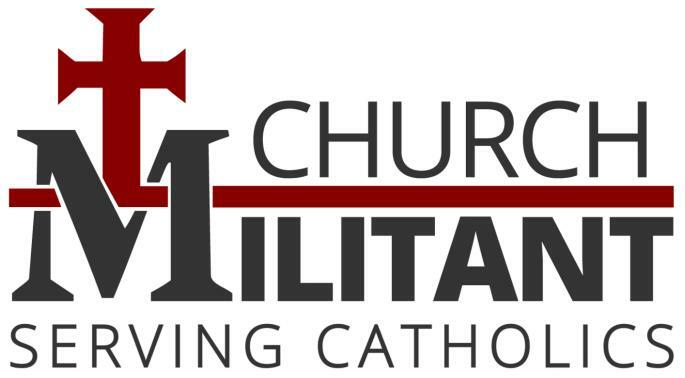 The Church and State in Art page documents the close relationship between faith and law in America. Washington D.C. is likely the best place in America to go to see typically early American expressions of Church and State in Art, due not only to the quality, but the vast quantity. Much may be learned about a given culture by observing the nature, the quality, and detecting cultural consistency in the art it produced, whether in paint, stone, music, dance, drama, literature or architecture. 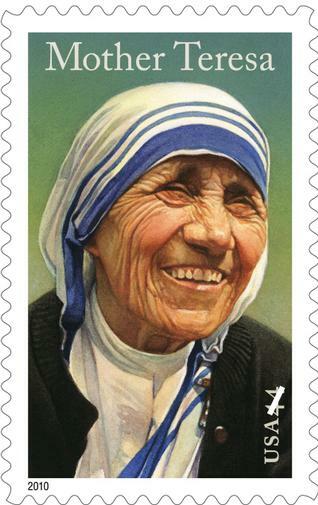 Consistency in art tells us much about the core values of the society of a given period. Whenever you look at art, including the art on this page, consider the people, their culture, and the period it came from, and compare the art to the art of other periods, including this one. Then meditate upon which culture appeared to be on the rise and which in decline, when compared to each other. 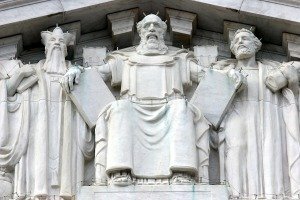 The history of the blending of religion, or at least of religious morality, and law is recorded in the art and architecture of Washington D.C. 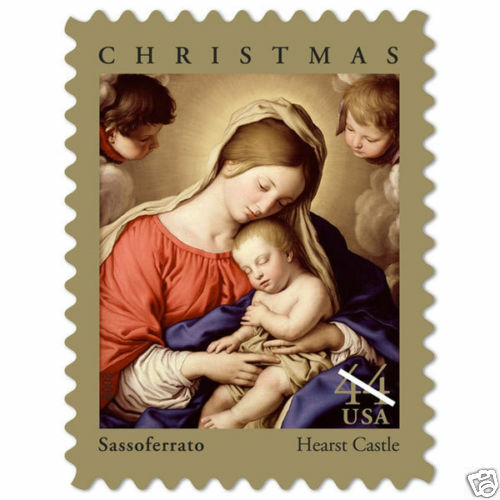 Many non-Jewish, non-Christian characters and symbols are depicted, representing historical developments such as the code of Hamorabi, the Justinian Code, etc. 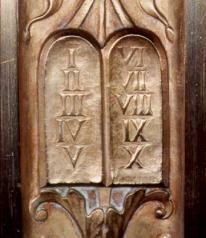 Significantly, no characters, symbols or representations are presented more often or more prominently than the Judeo-Christian Ten Commandments. 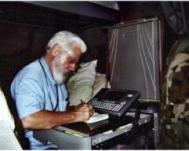 They are depicted most often as two stone tablets inscribed with the Roman numerals I through X; occasionally as one tablet numbered I through X; sometimes with the inscription LEX. This is representative of the Book of the Law. 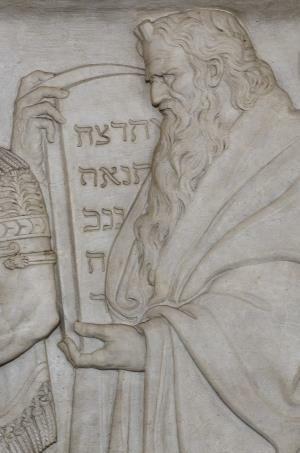 Historical figures are shown holding one or another form of the Book of the Law, sometimes in the form of a book, sometimes a tablet, sometimes reading or holding a scroll and sometimes – most significantly – holding five (5) scrolls, representing the Torah, the first five books of the Old Testament. This is, definitively, The Law. These depictions proclaim the principle that, whatever happens, The Law does not change; The Law is fixed forever, and may be depended upon. 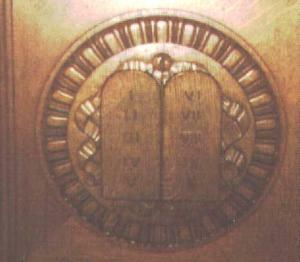 Moses with the ten Commandments, on the frieze facing the bench in the United States Supreme Court room. 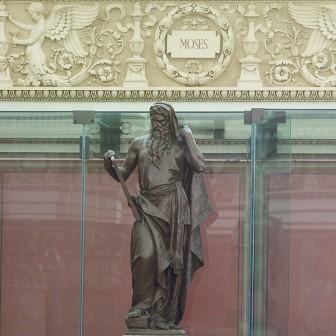 Moses in the Rotunda of the Library of Congress. 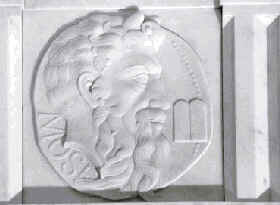 Another view of Moses in Library of congress. 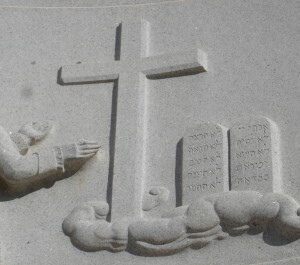 Here Moses represents the Old Testament in the larger theme of American Religion. Special thanks to Brenda. 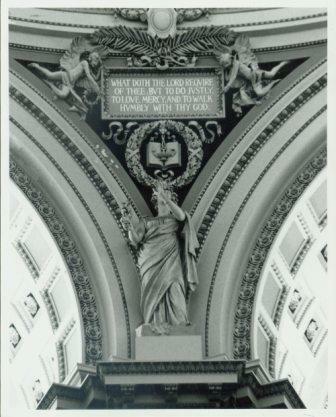 Saint Paul in the Library of Congress. 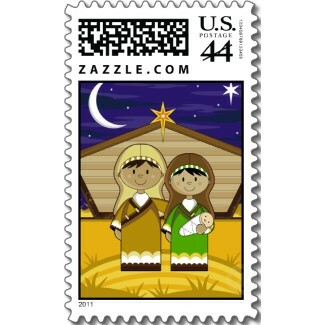 Here Saint Paul represents the New Testament in the larger theme of American Religion. Special thanks to Brenda. 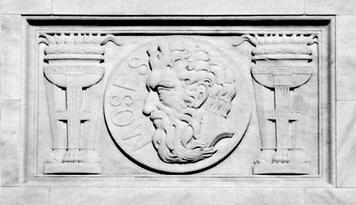 Another view of US Dist Court building frieze of the Ten Commandments. 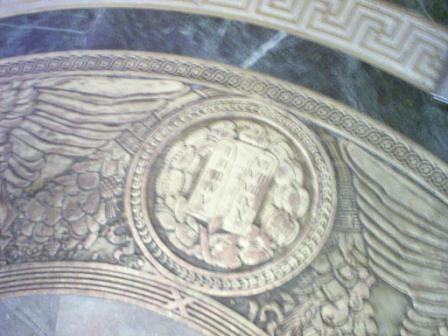 The Ten Commandments, carefully inlaid into the floor pattern of the National Archives building. 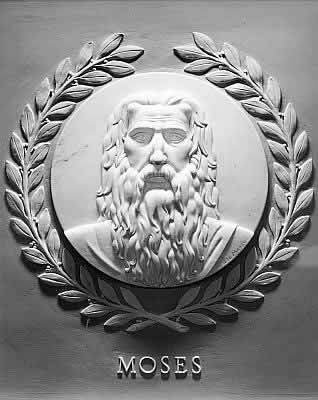 Moses the Law Giver depicted in the US House of Representatives Chamber. 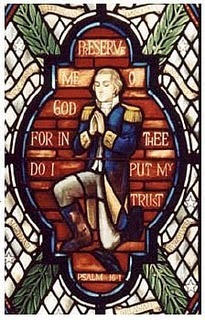 The Praying George Washington Stained Glass in House Chapel. Special thanks to Curmudgeon. Another view of the Desoto burial in the Mississippi. 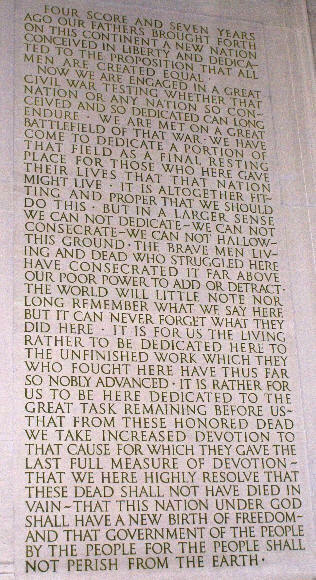 Some of Jefferson's words inscribed inside the Jefferson Memorial. 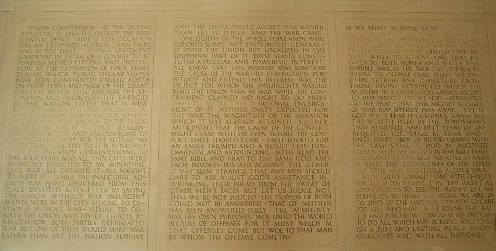 Some of Lincoln's words inscribed inside the Lincoln Memorial, including the Gettysburg Address and the Second Inaugural Address. Special thanks to Brenda. 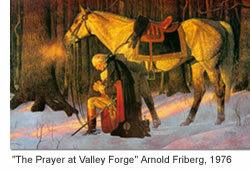 Washington, depicted at Valley Forge, hanging in the U. S. Capital. Once upon a time men were not too proud to pray on their knees. Special thanks to another anonymous friend. 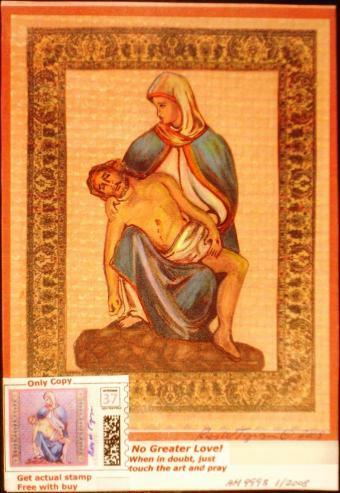 Just a few of the many, many U. S. postage stamps with religious themes. 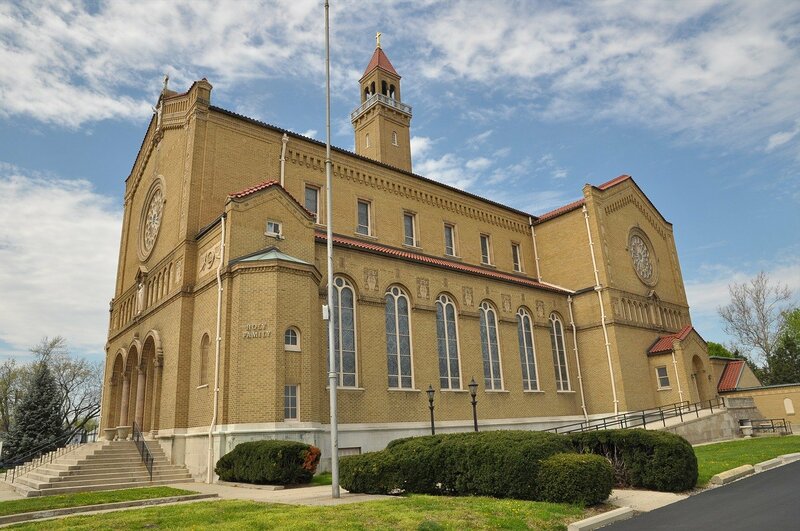 The Church and State in Art remains a contemporary artistic theme in America. The Church and State in Art page shows in a graphic way the close relationship between Judeo-Christian moral norms and civil law, as held by the founders, and as held to today by a significant majority of American citizens. 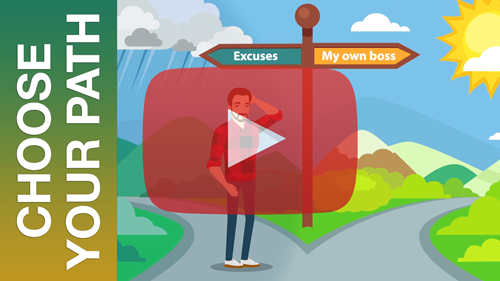 Elsewhere in this website, this theme is related to subject after subject; it is, indeed, at the root of all social standards, social arguments and political issues. 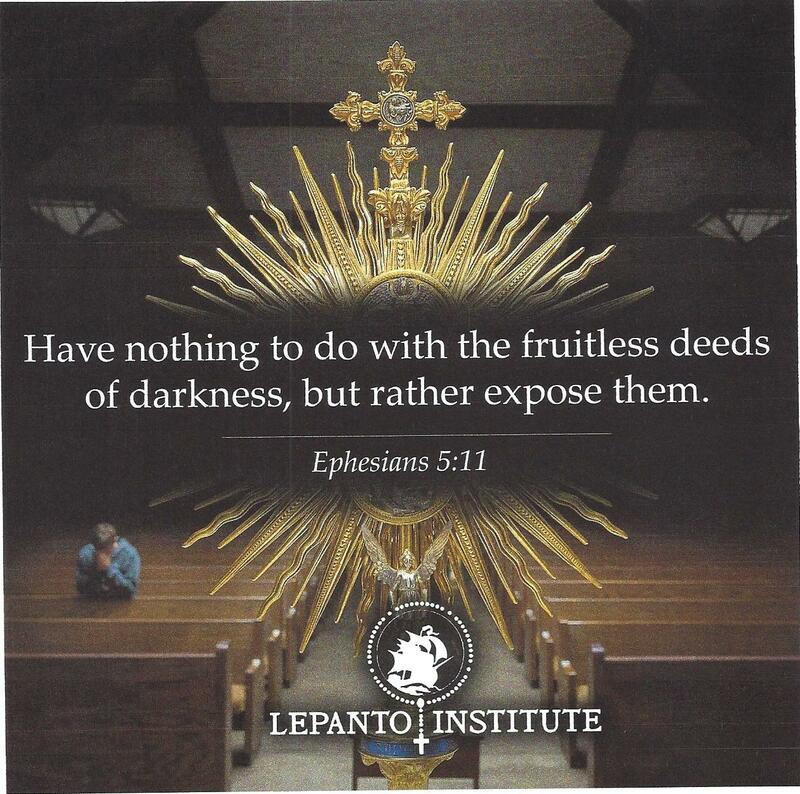 The Church and State in Art page puts it all into a nutshell. 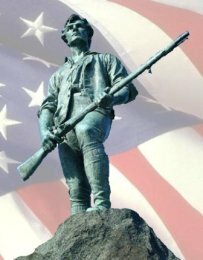 For a really beautiful pictorial directory of memorials, monuments, statues & other outdoor art in Washington D.C., our most monument-filled city, visit Washington DC Memorials. 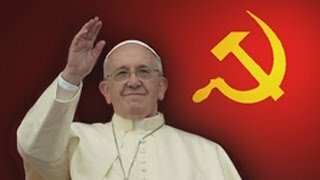 I addressed some of the author Dan Brown’s work in the The DaVinci Code page, and in more detail in the Perpetual Virginity page. In essence, Dan Brown is an imaginative and entertaining author, but as an historian or an historical novelist, he leaves much to be desired. His historical factual errors are so gross as to be comical. Masonry is not exactly my subject, being as it is strictly against my Catholic religion; but I do know several masons and am lightly acquainted with masonry, in as much as any outsider may be. It is, of course, a secret society, and there is much about it that cannot stand the light of day. 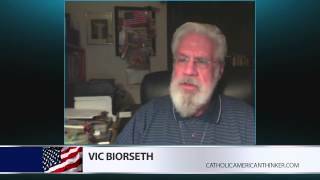 It involves, dark, secret sworn blood-oaths, involving cutting out the tongues or hearts of fellow masons who reveal any of the secrets, including the blood oaths, and so forth. For the most part, I believe most of the masons are relatively harmless and ignorant of the deeper rites, but that the relatively few higher-ups may have evil motives. 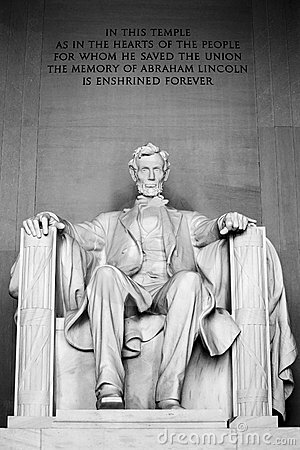 Regarding Masonic symbolism incorporated into American art and architecture, such as the “All Seeing Eye” within a triangle or a pyramid, as seen at the top of the Washington Monument and on the one dollar bill, that is a symbol that is older than Masonry, and even older than Christianity, probably originating in ancient Egypt. 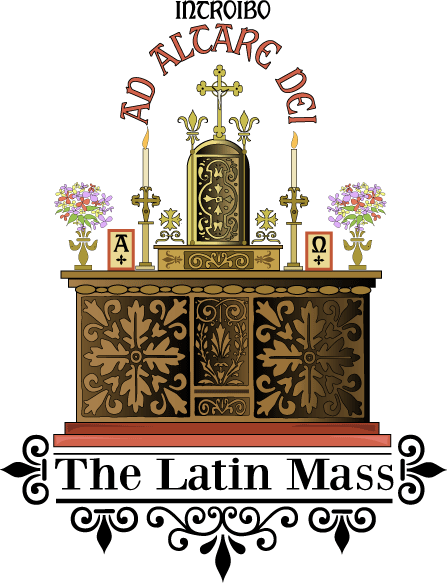 It was adopted by Christianity first, to represent the all-seeing eye of God; it was later adopted by Masonry. So it can’t really be called a strictly Masonic symbol, although it is one of the most widely recognized symbols in Masonry. 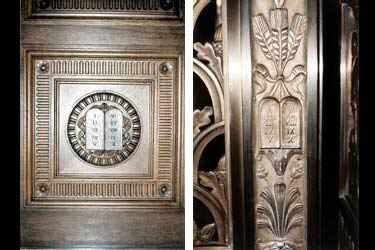 It is doubtful that there are any deep Masonic mysteries involved in Capital art in Washington. 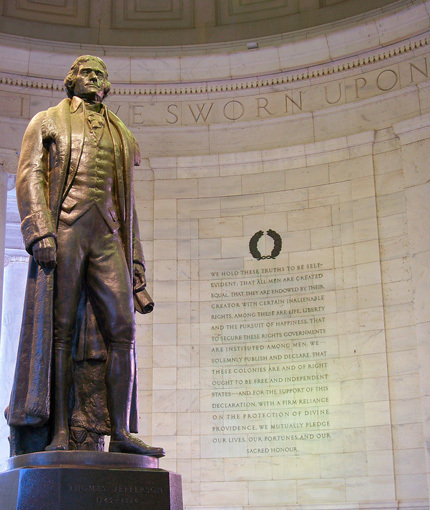 Many important historic figures were masons – our first President, George Washington was a mason. I don’t see that as particularly important. Masonry was virulently anti-Catholic in its first few centuries of existence, but I think today’s Masons are, for the most part, just a bunch of guys who like the fraternity and social events of their local chapters. 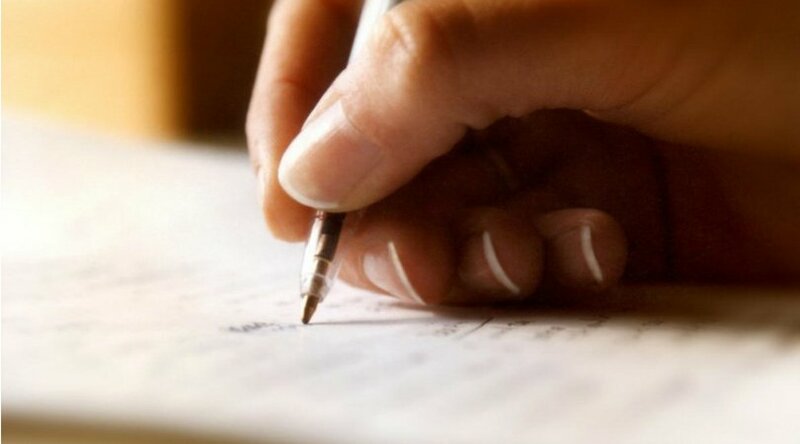 Wives are members of “auxiliary” orders; to my knowledge, there are no women masons. amazing places to visit before death. May OUR Sovereign God always continue to be exalted in our nation. 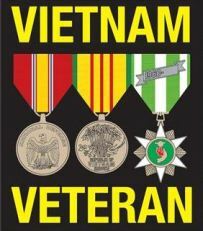 Remember our founders, God fearing founders and our forefathers HAD the right to Honor our Creator. 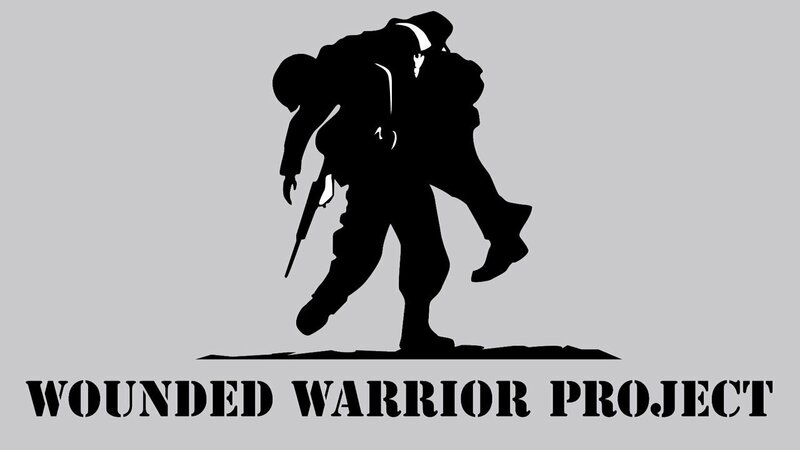 Let's respect them, our God and creator and our Nation. 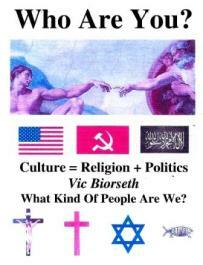 Before all these arguments existed, OUR GOD IS GOD. I have taken out all the junk related to the copyright brouhaha on the well studied advice of several of you. You are right; it was not only distracting, but detracting from the message of the page as well as of the larger site. Thank you BJ, Brenda and Curmudgeon. It looks better now. Not sure; either someone sent it to me in an email, or I found it somewhere on the internet back in the 2013 time-frame.